NPCs don't sit around in rented inn rooms anymore. Removed two main files and replaced the follower sitting mechanic with a utility spell. Fixed the version in esp header so Wrye Bash doesn't give any warnings. Fixed edits in the normal version that were causing all chairs to be wooden chairs. NPCs don't sit around in rented rooms anymore. You can still give the ability to sandbox in your room to certain NPCS like your followers if you want to. An XMarker that may have been causing NPCs to spawn in your room in Candlehearth Hall has been moved. When you first load into the game with this installed, you'll receive a new ability called "GTFO My Room - NPC Sitting Ability". If you use this spell on an NPC, it will toggle their ability to sit (sandbox) in the rental room chairs on/off. 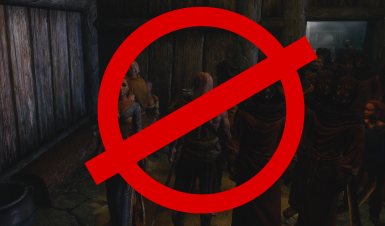 If you don't want any followers or other NPCs to be able to sit in your room, you don't need to do anything. The older versions that worked differently have the proper readme files to describe their use. Install one of the main files with a mod manager. Deleting the mod should work normally but I can't guarantee it so do it at your own risk. USKP fixes have been forwarded. Won't work with inn overhauls or anything else that edits those chairs. Someone might make a patch. Won't work for new inns.